We use only professional quality window cleaning equipment. We start by using a soft scrubber to remove dirt, and then use a light, environmentally friendly soap that won’t be hard on your windows or your windowsills. Next we use a wide scraper to remove any paint over-spray, bug marks, sap, etc. We’ll then squeegee the water off, and towel dry around the pane where water collects. ​We pride ourselves on our special attention to detail, and guarantee customer satisfaction for all of our work. 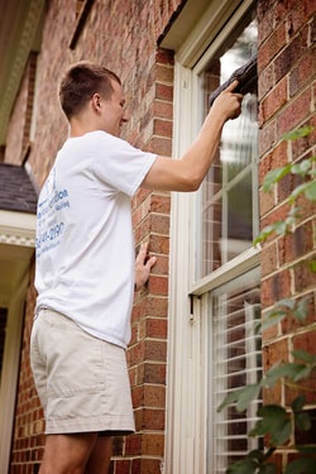 Our 48 hour streak-free guarantee means that if you notice any streaks on your windows within 48 hours of a our team finishing the project, we will return at no cost to you to re-do the job!